Senate OKs Judicial Nominees, Tax Extensions Before Republican Takeover : The Two-Way Lawmakers in the Senate approved an extension of tax breaks and confirmed 12 more judicial nominees, but a terrorism insurance bill didn't survive the night. 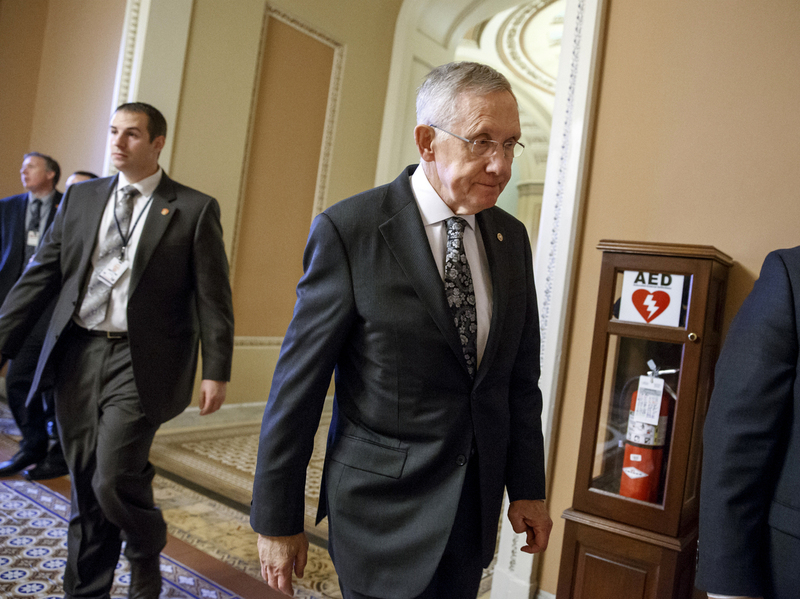 Senator Harry Reid of Nev. on Tuesday, walks to one of his final meetings as the Senate Majority Leader. In January, Republicans take over the majority. "That means President Obama got 88 judges confirmed this year, which is about double the number he got confirmed last year. Probably the biggest factor driving the increase was Senate Majority Leader Harry Reid's decision last November to get rid of the filibuster for most judicial nominations." The extension of tax breaks, however, will last little more than two weeks, expiring at the end of 2014. Forbes quoted Sen. Orrin Hatch, R-UT, saying the bill was "quite literally the best we could do." Politico called it a bill "that nobody really wanted," pointing to an earlier effort by Senate Majority Leader Harry Reid, who worked with House Ways and Means Committee Chairman Dave Camp, R-Mich., to build legislation that would have lasted two years. But the White House intervened. Obama issued a pre-emptive veto threat before the pact was done, complaining that Democrats got a raw deal because it failed to make permanent an expansion of its favored tax credits for working families. That move effectively killed any remaining attempts to pass a two-year extension that had been approved by the Senate Finance Committee. The Senate will need to work on a new plan for the tax breaks at the start of the new year. Further disappointing Senate Democrats was a failure to pass a bill authorizing the Terrorism Risk Insurance Act (TRIA). Senator Tom Coburn, R-Okla., blocked a vote on the bill, which The Hill reported essentially killed the legislation. Still, it was a productive day in Washington as President Obama, according to a White House statement, signed the government funding bill that will last through September of next year. The only exception is the Department of Homeland Security, which is funded through February. The Senate confirmed several other of the President's nominations, including Anthony Blinken as Deputy Secretary of State. On Monday, NPR reported the Senate also confirmed Vivek Murthy as the country's new surgeon general, a position that has been vacant for 17 months.